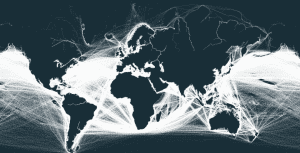 Map from Marine Traffic via reddit The map above shows the density of shipping traffic around the world. On the whole, areas of high population destiny, also have a high degree of shipping density. Map created by reddit user mattsdfgh; click here for full size With a few notable exceptions, The map above shows the outline of the world’s continents simply by visualizing shipping routes.